The Arizona state government is secretly funding an anti-LGBTQ hate group by selling specialty license plates on their behalf. The “In God We Trust” plate benefits the Alliance Defending Freedom, a group that files legal challenges to overturn nondiscrimination protections that include sexual orientation and gender identity. The plate sells for $25. $17 of the cost goes to the hate group. The state has raised over a million dollars for the organization. Alliance Defending Freedom defended Jack Phillips in the Supreme Court Masterpiece Cakeshop case to defend the anti-gay baker who refused service to a gay couple. They’re also notorious for filing lawsuits attempting to overturn local and state nondiscrimination laws. The group has recently filed lawsuits challenging bans on “ex-gay” conversion therapy and defended a homeless shelter’s “religious freedom” to ban transgender people from the facility. The state is not required to tell the public where the proceeds of the sale is distributed. State senator Juan Mendez has filed legislation that would require the state to create a public list of where the money actually goes. The list would require the state to list the name and mission statement of each group receiving benefits from the sale of specialty license plates. 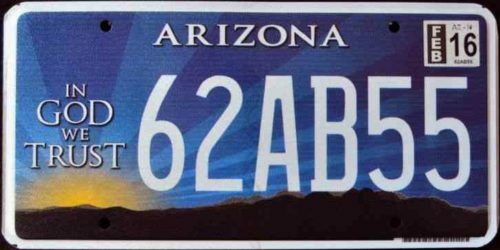 “The legislation establishing this license plate passed as a floor amendment with no discussion — there was no public awareness of what was happening or where the money was going,” says Tory Roberg, the director of government affairs for the Secular Coalition for Arizona. Mendez has also filed a bill to repeal the sale of the license plate altogether. “What do people not understand about the inappropriateness of this kind of fundamentalist inspired, state-sanctioned discrimination?” says David Felten, a pastor at Fountain Hill United Methodist Church, told the local media.